Are you looking for a local wasp control service to tackle your wasps? 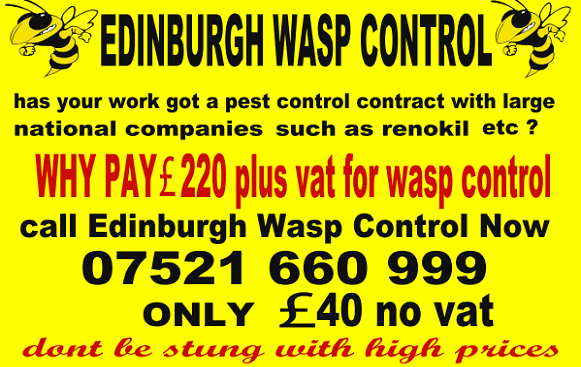 We are a small locally run wasp removal service providing effective wasp eradication for a flat fee of just £40. There is NO vat or hidden costs to be added. 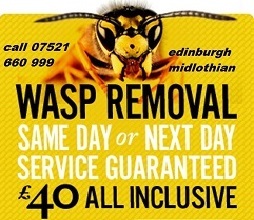 We have been providing Wasp Nest Removal in Edinburgh for many years, allowing us to gain a valuable reputation for our swift and effective treatments throughout the summer. Finding a wasp nest can be very distressing and dangerous and will often need a quick response to ensure it’s dealt with effectively. One of the questions we often get asked by our customers is "how can we get rid of a wasp Nest?" and our reply is that we would strongly advise anyone looking to remove wasps or a nest that the danger of not being trained and suitably protected can be very dangerous. If you find a wasps nest never approach or disturb it as wasps will attack you to defend their nest. At Browns Town and Country are extremely professional and trained in safe methods of all Wasp Nest Removal. We strongly advise that you never attempt to remove a Wasp Nest yourself as this can be dangerous and there may be a chance of the wasps stinging you, also caution is needed when approaching any nest, as if wasps start to feel threatened they will sting, so if you are unsure just give us a call and we shall come out the same day and remove the nest for you saftely.